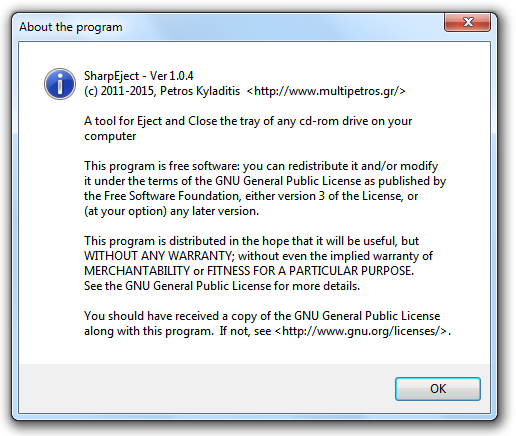 A tool for Eject and Load the Tray of the selected CD-ROM drive via software. 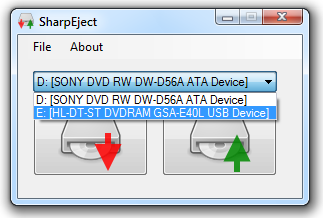 From the combo box at the top of the program you can select the optical drive you want to dial with. If your drive didn’t appeared, you can reload the available drives list by hiting ‘F5’, or by selecting the reload option from the file menu. If you have only one drive you haven’t need to worry about this option at all. 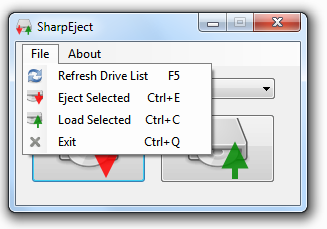 To Eject the selected drive’s tray just click on the Eject button, with the red outgoing arrow. 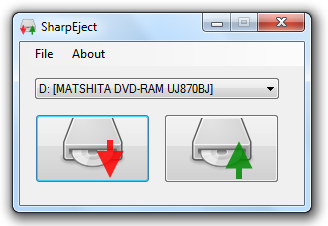 To Load the selected drive’s tray just click on the Load button, with the green incoming arrow. This program is designed for Microsoft Windows with Win32 MCI API support (winmm.dll) and .NET Framework 3.5 installed.